Perhaps you may want to give a Bible as a Christmas gift. Hardly ever a bad idea. As you can imagine, we have nearly every possible translation, size, shape, color and format. No matter what your preference—or, more to the point, what you think would be most helpful for the one you are gifting—we can help. Do give us a call so we can chat, since it is a bit complicated, but we can help you find choose just the right edition. Here, for instance, are two very different options, both pretty spectacular in their own way. You may know that the recent English Standard Version is the hottest translation amongst conservative evangelicals, and other folks too, who want a rendering that is utterly faithful, knowingly conservative in the translation process, yet committed to both readability and a significant degree of class. Frankly, some have thought this may sound a bit like the old RSV; it retains much of the dignity of language lost in more colloquial editions, and yet is still very accessible to modern readers. It does not use inclusive language for gender so it is driven by a bit of ideological bias (oddly thinking that inclusive language is an ideological bias, but that translating anthropos as “men” is not.) If one does not mind that quaint mis-speaking, many think it reads quite well. Crossway certainly has put it out in some very handsome editions, very cool compact leathers, some rich text editions, a wide-margin hardback for note-taking with a moleskin band. Earlier this fall, the very, very much anticipated study Bible edition was released to much fanfare and it truly is a tour de force, with 20,000 notes, and great maps, charts, articles and cross-references galore. The notes are stimulating, balanced, if traditionally evangelical, with a bit of a Reformed Protestant bias. 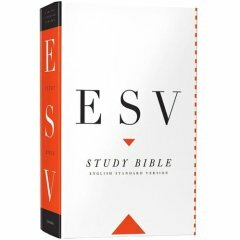 (John Piper calls its scope and faithfulness “breathtaking” and Jerry Bridges says that it is the “finest study tool I’ve seen in 50 years of Bible teaching.” Joni Eareckson Tada raves, saying “it’s clarity and beauty are extraordinary.”) These church leaders are right: the ESV Study Bible is an extraordinary resource. With it even comes a completely free on-line version for download, too. We have the big hardback on sale at 25% off the regular price of $49.99 making it just $37.50. (If you want a nice leather edition, call or email; they are very nice; the gift of a lifetime.) You can read a bit about it here, but do come back to BookNotes if you want to order it! Thanks. 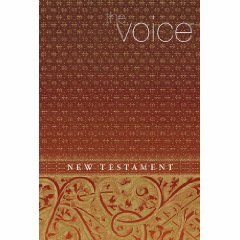 On the opposite end of the “translation spectrum” is The Voice New Testament, a hip Bible project creatively midwifed by good folks who are somewhat involved in the emergent conversation and contemporary worship movements (and others not connected with any particular movement.) Chris Seay, Brian McLaren, Lauren Winner, Greg Garrett and others did these paraphrases, with a high interest in helping readers get the essential literary style, the texture, the story. (They have conversations written out like a screenplay script, making it very clear who said what.) Most Bible translations start with serious exegetes, Greek or Hebrew scholars, who do their best to render the words into technically accurate phrases. Then, linguists and reading specialists go back over it, perhaps, helping polish the prose into something readable. The methodology of The Voice was the reverse: they had poets and preachers have at it, render the text as best they could, in beautiful, contemporary style, with communication—capturing the tone and story— at the higest premium. Then, they had the Greek experts review it, refining it, correcting any misunderstandings or inaccuracies. The theologically diverse musicians, pastors, and writers who composed this new version are deeply committed to good and clear and wondrous language, and the Bible scholars who backed ’em up are very solid. (Dr. Tremper Longman, for instance, who suggests that it could transform one’s life, says it is “faithful to the original” or Dr. Darrell Bock, no shill for the emergent post-evangelicals, who blurbs it saying “Presenting the biblical contents in a lyrical and narrative manner is another way of teaching and preaching the Bible…opening up opportunity to hear old stories in a fresh way or allowing one to hear them for the first time in an engaging way.” Some have described it as a postmodern Message. It makes for a fascinating project. Here is a good interview with one of the creators, explaining the hopes for the project. You may have seen some of these as they published them book by book over the last year or so, with creative art designed covers, clever titles, small paperbacks. There have been a couple of companion music CDs. Now, they’ve got the whole New Testament done, presented in beautiful two color ink, with sweet calligraphy on occasion and cool sidebars with devotional commentary and a bit of shrewd application cues. They are a sight to behold, in two great editions. The rich looking paperback is shown above and the hemp-like burlappy edition has a solid brown leather swatch across it—the picture on the right doesn’t do it justice. Both are very, very cool. We have both of them at 25% off the regular retail price. The paperback is usually $19.99, making our sale price $14.99. 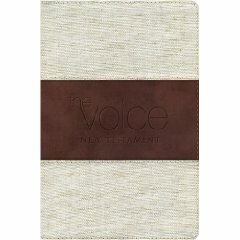 The paper slip-cased flexible cloth/leather edition is regularly $34.99 with our discounted price $26.25. The NLT Study Bible is also worth mentioning. It is just as scholarly as the ESV Study Bible, but the translation doesn’t require a gender-bias disclaimer. Check out the full online version free for 30 days at the website. Thanks for this…I love the New Living Translation, and some people I really respect (like Al Wolters, author of an H&M fav, Creation Regained) helped with the translation. I’ve appreciated the NLT Life Application Study Bible, but now the new NLT Study is out, and it is very good. I’ll do a blog post about it, too, soon, I hope. THANKS for the input. I had a chance to check out Ecclesia church in Houston during a recent visit, and picked up the Voice translation of John somewhat skeptically. I quickly appreciated that this is a serious work that is accessible and just plain inspiring. These emergent folks are no lightweights, and this volume should be widely read by new and old Christians.